The HGE hydrokinetic turbine was the industry’s first surface-suspended, asymmetrically-ducted horizontal axis turbine. The turbine’s three blades could spin at 21 RPM, making the device the slowest spinning hydrokinetic turbine in the industry at the time. The unit’s rotor was 12 feet in diameter. The overall dimensions, including barge and support structure, for the unit was approximately 24 ft long x 15 ft wide x 15 ft deep and was tethered to the existing dam structure and anchored for stability. Two synchronous alternating current (AC) motor generating units sat atop the barge and a 225-ampre molded case circuit breaker and a 480-volt three-phase feeder connected the units to the existing power plant distribution system and appurtenant facilities. Hydro Green Energy’s project was the first FERC licensed and commercially operational hydrokinetic power station in U.S. history. The HE turbines were located directly downstream of a conventional hydroelectric station that produces about 4.4 MW and is licensed by the City of Hastings, Minnesota. The 110 × 600 ft (34 × 183 m) lock is operated by the USACE St. Paul District. The conventional hydropower project includes two Kaplan bulb turbines. Located approximately 50 feet downstream of the draft tube exits from a hydroelectric station that produces power for Hastings, Minnesota, USA, at Mississippi River mile 815.2 in around 15 feet of water depth. The licensee held an introductory outreach meeting on April 6, 2007 to provide an initial briefing on the project to Federal and state agencies, affected Indian tribes, and local stakeholders. The licensees mailed a 1st stage draft license amendment application to stakeholders on June 13, 2007, and followed up with a public meeting on July 16, 2007. During the meeting, participants identified aquatic resources and water quality as important issues, and scheduled a conference call to discuss them in more detail. The licensee circulated a draft study plan focused on these issues on July 18, 2007, and the conference call was held on July 20, 2007. The licensee mailed a 2nd stage draft license amendment application on October 29, 2007. The City filed its final application for amendment on April 24, 2008 (City, 2008a). The Commission issued a letter to the City on June 4, 2008 requesting additional information about the project (FERC, 2008). On June 11, 2008, Commission staff held a site visit, inviting stakeholders to attend and provide relevant information to assist the Commission in preparing the EA. The City filed its response to the FERC AIR on June 19, 2008 (City, 2008b). FERC granted an amendment to install two 35-kW hydrokinetic turbines to the existing license on December 13, 2008 and authorized the installation on December 23, 2008. 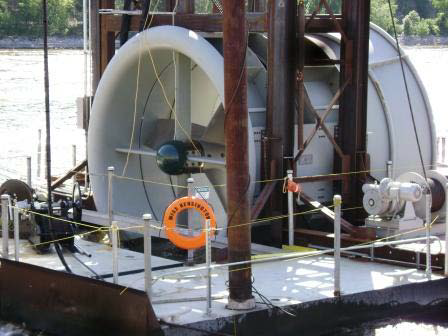 The barge-mounted hydrokinetic units were installed on August 20, 2009, and Hydro Green was able to demonstrate their operability. On May 21 2012, the city of Hasting applied to FERC to remove the hydrokinetic units from its license. The following stakeholders were consulted, through meeting attendance, conference calls, letters, or site visits: the St. Paul District of the USACE, FWS, U.S. Geological Survey (USGS), U.S. Environmental Protection Agency Region 5, National Park Service (NPS), U.S. Bureau of Indian Affairs, Congressman John Kline, Minnesota Pollution Control Agency (MPCA), Minnesota Department of Natural Resources (MDNR), Minnesota Department of Commerce Energy Division, Minnesota Public Utilities Commission, State Historic Preservation Office (SHPO), the Prairie Island Indian Community, the Dakota County Physical Development Division, and the Regional Council of Carpenters. Licensing of hydropower facilities is governed by Part I of the Federal Power Act (FPA), 16 U.S.C. §§ 791(a) – 825(r). Licensing at Corps facilities is also governed by a 1981 Memorandum of Understanding between The Federal Energy Regulatory Commission and the Department of the Army. The primary issues identified to date are the potential effects of the project on water quality, fish (the risk of entrainment, in particular), and dispersal of zebra mussels. Because hydrokinetic turbine technology is new, stakeholders have emphasized the need for careful study and monitoring of its effects in these areas. Lock and Dam No. 2 Hydroelectric Project is located in United States of America. Studies and collection of data prior to installation of the turbines. Assessment of fish presence in the area. Review of previous studies conducted following the original dam hydrokinetic construction. Tables showing the species composition by month. Assessment of mussel presence in the area. Review of US Fish and Wildlife surveys. A total of 21 of the 44 freshwater mussel species present in the upper Mississippi River system have been found in Pool 2. Visual surveys for the presence of endangered birds. Bald and Golden Eagles present. Monitoring studies completed after the installation of the turbines. The City proposes to use the HI-Z Turb’ N Tag tag-recapture technique. All fish releases occurred between 5 and 11 June 2009. The recapture rate (physical retrieval of fish) was 98% each for the treatment groups of yellow perch and bluegill. The recapture rates for the control groups of yellow perch and bluegill were 96% and 100%, respectively. The recapture rate for the treatment group of adult channel catfish was 99% and 100% for the controls. The recapture rates for the smallmouth buffalo and bigmouth buffalo were 100% for both the treatment and controls. Mussel presence in order to protect endangered pearlymussel & remove invasive zebra mussels. No mussel presence in scour area. No Zebra mussels reported. Bald and Golden Eagle surveys. Observations to describe the bird use of the tailrace, taken at monthly intervals to capture seasonal variation. Conduct water quality studies, including monitoring of temperature, dissolved oxygen, and turbidity for 1 month following turbine installation. 4. collect the data before 0900 hr to get worst case (or close to worst) scenarios in a daily cycle. No impact on water quality.